We can HEAR you're preparing our food, open the gate!!! Off to the vet for our health check and certificate. 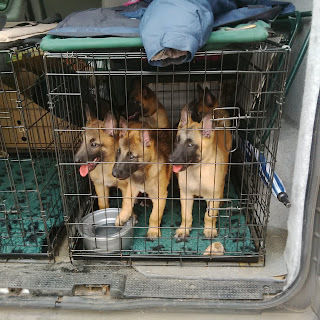 The vet put into writing that the pups were fine to leave for their new homes from today. 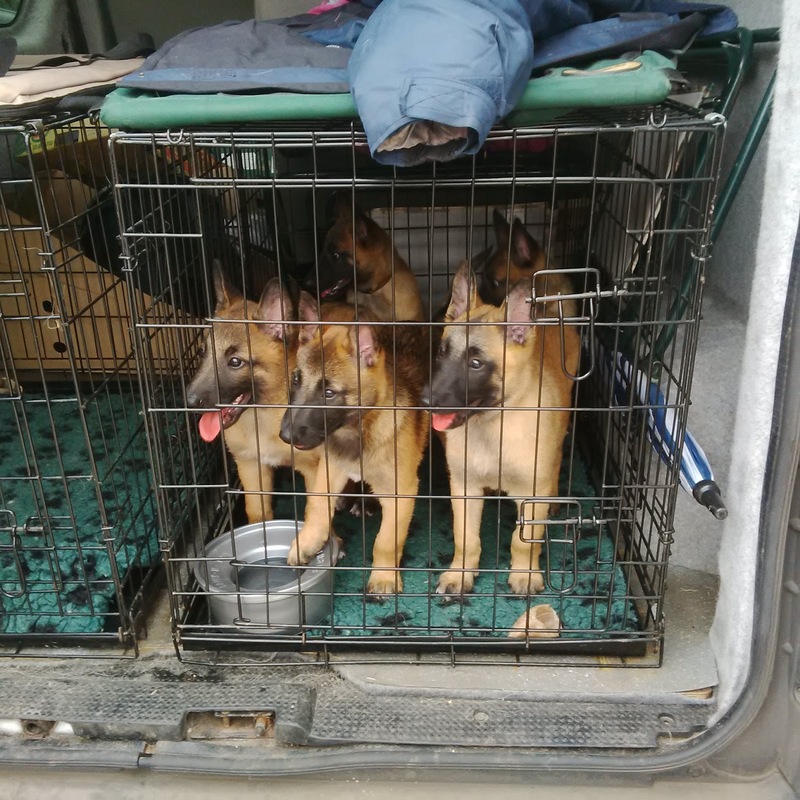 Not easy to transport 11 pups to the vet! This is the pile of paperwork for all the puppies -weight over 3 kilos! The first puppy to leave home was Purple. Bye bye to GOLDMALI LUCKY STAR, pet name HETTY, who has gone to live on a smallholding with lots of animals, and is going to have a very busy life indeed. Playtime with mum. Yellow at the front has had her collar chewed up so is now without. 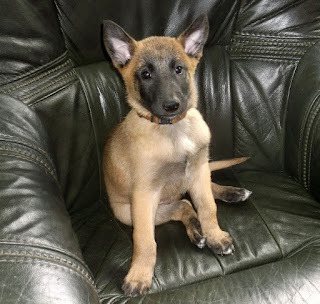 Then it was bye bye to Blue, GOLDMALI LIFE OF RILEY, aka BRUNO II who is going to have an active life, even climbing mountains. And then Beige left, GOLDMALI LIONHEART aka TIDUS, who is going to be an agility dog. Green is not going anywhere, she's staying with me. GOLDMALI LULLABY aka DANA. Only locked in the pen at night now but we still like to go in it to play -roughly! I forgot to take a last photo so we have to make do with one already used. Bye bye to Black, GOLDMALI LIGHTNING aka JAGO, who is also going to be an agility dog. Back to the vet again for five of us (those staying longer, or in Dana's case, permanently) for the first vaccination. It was a very hot day. During the two van trips to the vet (i.e. including last week's as well) we got to see cars, motorbikes and all sorts of new things. And it was bye bye to Yellow, GOLDMALI LUCK BE A LADY aka DORIS, who went to live with Stanley, one of our Rona's litterbrothers. Just a couple of pictures of Red, who is staying a bit longer. None of the pups wear collars now since Dana's got chewed up too -it's too dangerous now. As the pups are microchipped there is no risk of them being mixed up -although we can of course tell them apart anyway.